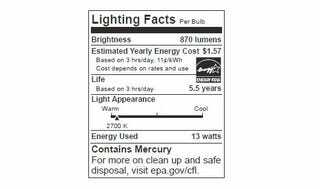 Soon, when you buy a new light bulb you'll see a new Nutrition Facts-style label that details the numbers most important to you: how bright the bulb is, what the energy cost is, and when they'll burn out. In old light bulbs, wattage was the main unit of measurement. That was nice and all but since wattage is more a measurement of energy usage, it wasn't really relevant to a lightbulb's primary purpose: brightness. With these new labels, lumens, a measurement of brightness, will get top billing.